But I'm getting ahead of myself. Let's start at the start: what do cashew plants look like and how and where do cashew trees grow? 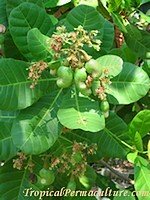 What Do Cashew Plants Look Like? 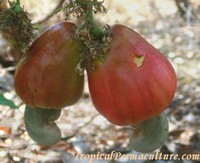 Cashew trees are attractive trees with large leaves and pretty, pink flowers. Cashews, as you know them, are nuts. But the cashew nut is not the only fruit of the cashew trees. Or rather, the cashew nut is only a part of the cashew fruit. The other part is called the cashew apple. (Although pear would suit it much better...) And if I wanted to be super accurate then I'd have to point out that the cashew apple is actually the swollen stem of the fruit. Anyway, you can see some ripe cashew apples in the picture. The cashew nut is inside the funny looking, kidney shaped shell that is attached to the bottom of the cashew apple. Also inside that shell is a very nasty, caustic liquid that causes severe burns, so be careful when handling it. More on processing and shelling cashews later. Where Can You Grow Cashew Trees? You can grow cashew trees anywhere in the wet/dry tropics. The main producers of cashew nuts are Brazil, India, Vietnam, Africa (Tanzania and Mozambique) and South East Asia. Day temperatures for growing cashews should not drop below 10°C (50F), and cashew trees handle temperatures above 40°C (105F) well. An average day temperature of around 25°C (77F) is ideal. As long as they have some water cashew trees grow like weeds. They are fairly draught resistant and grow well even on marginal soils where other fruit trees would fail. The best soils for growing cashews are sandy soils. Wild birds and bats are attracted to cashew apples. Especially the fruit bats carry them off and drop the left overs, and that's how I ended up with cashew trees in my garden. I didn't plant them, the bats did. The cashew tree in the picture is on the very edge of my garden. It doesn't get much water, it never saw any fertilizer, and it's as healthy as they come. Some fruit tree nurseries stock seedling or grafted trees. Commercial growers usually propagate their own. If you have a grower in the area you may be able to buy stock of him. If you want to grow your cashew trees from seeds you can start them in pots or put them straight in the ground. Keep them moist and they should sprout within four or five days. Best planting time? When you can get hold of fresh seed. The sooner you plant it, the better. Select a well drained spot (cashew trees don't like wet feet or heavy clay soils), preferably a place that has some protection from strong winds. Mature trees need about 10 metres distance between them, and they grow to 12 metres tall. Cashews grow best in sandy soils, but sandy soils don't hold much water and are generally not very fertile. The trees will still do fine without additional attention. Cashew trees flower and set fruit during the dry season (winter), and you should be able to pick them within a couple of months. If you don't have birds dictating your harvest times use these signs: the apple has a nice pink or red colour (some are yellow) and the shell of the nut turns a dull grey. When the fruit falls to the ground it's definitely ready. Separate the cashew apple from the nut, and enjoy the apple. Luckily the nuts keep very well inside their shells. You can store them for two years so you don't have to process every batch you pick. Keep them somewhere cool and dry until you have enough to justify the effort of processing them. You can't just shell and eat cashew nuts like other nuts. Their shell is full of a horrible, caustic liquid that will burn holes into you! The challenge is to separate the nut from the shell without getting the stuff on your skin, or worse, into your eyes. One method is to freeze the shells, and then separate the shell from the nut before it thaws. You still need gloves and long clothes and I'd also use safety glasses, just in case. The nuts can be eaten raw, but please, please make sure they are not contaminated with any of that liquid! Another roasting method is to heat the nuts for a minute in an open pan with holes (so the caustic liquid can drain away). I think you are supposed to do that over an open fire. Don't breathe in the fumes, and if the nuts catch fire douse them with water... After the roasting you have to put the nuts into sawdust or something absorbent to remove the last of the caustic liquid. After roasting and drying you can finally shell your cashew nuts. PS. : Here is another little tip I received from a reader. Rakmi writes: "Just to let you know that the young shoots are delicious eaten with rice and dishes. The apple may be cut into thick strips, chiplike, blanched in water, squeezed to remove water and cooked as any other vege. Happy trying!" Thanks, Rakmi!